You will earn 8,306 Reward Points. Earn 1 reward point for every 1 dollar spent. "SS/SU" series models have 10 sealed, high-performance elements with over-heat protection and 6-heat switch controlled, CE approved model SU684, or North American Model SS684. 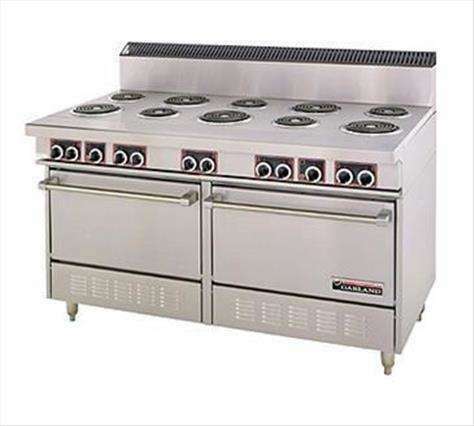 Electric medium duty range with 2 full-size ovens, all porcelain oven interior, contoured front stainless steel plate rail, 60" (1524mm) wide, with 10 all purpose tubular heat‑ ing elements. Stainless steel exterior, with stainless steel 10" (254mm) high backguard with slotted black enameled angled cap. Available with optional sealed elements with "over-heat protection" – reducing power if element is turned on w/o pan for 8 minutes, hot top(s) and griddle. Available with convection oven base(s). NOTE: Ranges supplied with casters must be installed with an approved restraining device. Where can I get an electrical schematic of the Garland S684 series range/oven? I was able to find some information here. Please copy paste this URL in your web browser http://www.garlandcanada.ca/asset/?id=ofake If this does not contain the information you require, please reach out to Garland US Range directly and ask to speak with a technical consultant who can guide you or provide you with that information.